I’m so happy to be posting again. I have a few things waiting to be photographed so expect those posts soon. And I’m happy to report I’ve started sewing again following my move (more on that another day)! So if you haven’t guessed by the name of this post I have something nautical for you today. 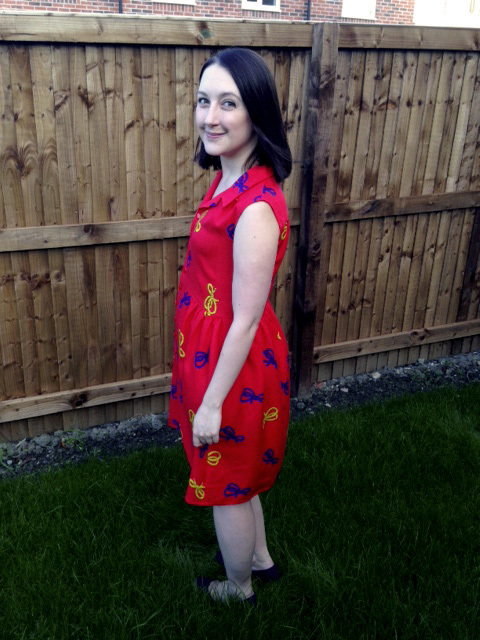 Let me present my nautical knot shirtdress, courtesy of the wonder that is Joel and Son Fabrics. The lovely folk at J&S heard me lamenting on twitter how I’d love to buy some of this linen but I was still on my self-imposed spending ban (we were about to cross the finish line for completing on our new house). They came to my rescue offering me the chance to review their site and this gorgeous print! 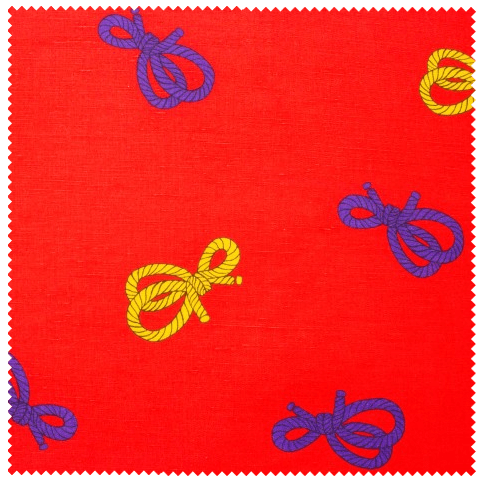 This fabric is an amazing tomato red colour with bright yellow and blue knots on it. It makes me happy just looking at it! And if you haven’t ever ordered from J&S you can expect your fabric folded in tissue, sealed with a quality assurance sticker and wrapped in one of their signature bags. I even got a cute mini tape measure in my parcel! Now that’s good customer service. It’s a linen but happily doesn’t crease too much because it has some viscose in the mix. Think I lie? This dress was pulled out of the suitcase it moved in and WAS NOT IRONED before I took these pics. Brilliant right? And at 140cm wide I only needed 1.5m to make this dress. I’m a bit of a renegade though. You might have noticed “dry clean” is the suggested handling for the fabric. That doesn’t work for me. I took the risk and washed it on a handwash setting. And… HUZZAH! It only lost a teeny amount of the colour and there was no degradation to the linen weave. So what shirtdress is this? 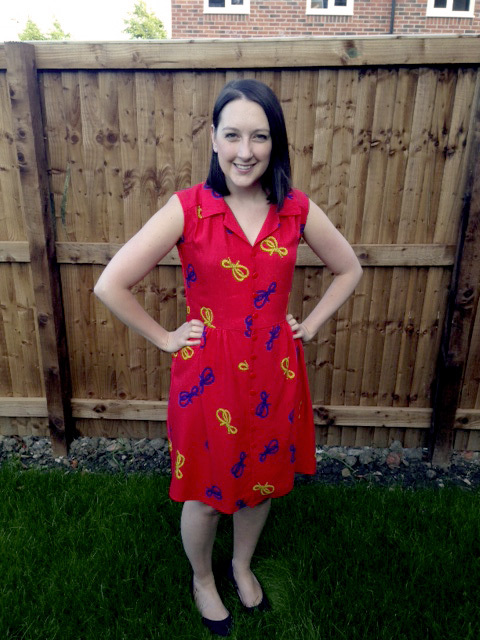 It’s Simplicity 1880, previously made by me here and the popular pattern from this sewalong. As per the last time I amended the skirt to have a button front, plus I lined the skirt with a poly-crepe (so I wouldn’t get the dreaded tights-sticking issue). 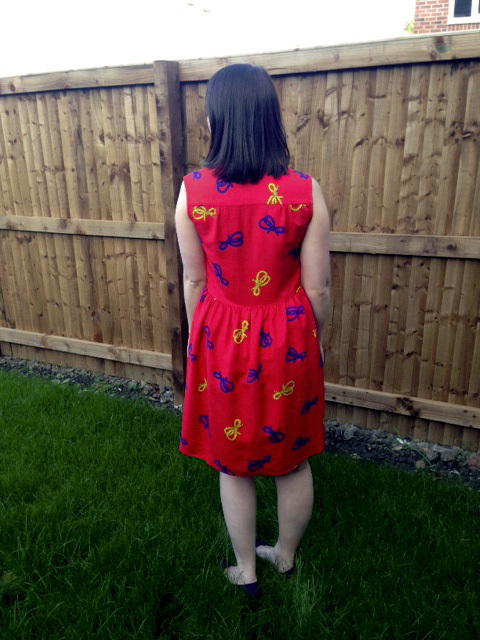 I also included a back neck facing and used french seams wherever possible. I really recommend this pattern for when you don’t want darts to ruin print placement. It was perfect for these knots. I even managed with some clever placement, to get a 99% red collar when looking from the front; I thought that would give a nice clean look. I also fought the temptation to use gold anchor buttons and went for these red shiny vintage lovelies that I had in my stash. Now my challenge is staying away from the awesome printed silks on the J&S site, like this panda awesome-ness. Or their cottons for that matter, like this pretty little number. I dare you not to find something to lust over on this website!! Fabulous dress, impressed by the fact it doesn’t need an iron. You look great in this. I don’t like dry cleaning either. Thank you!! And high fives for no dry cleaning! 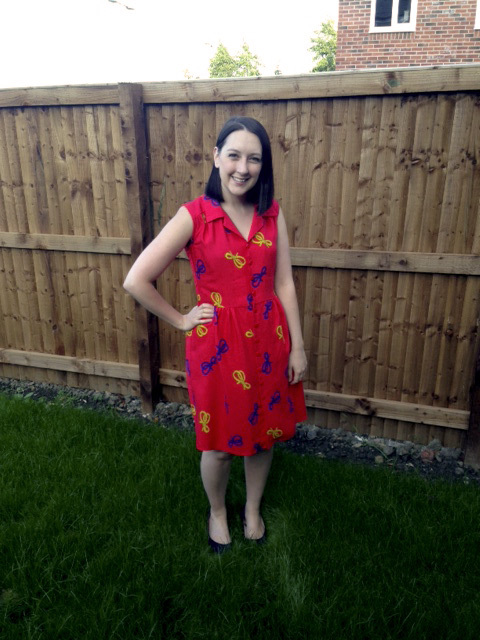 Oh Amy, why did you link to the SEVENTY POUNDS A METRE panda fabric! I can’t get it out of my head now. 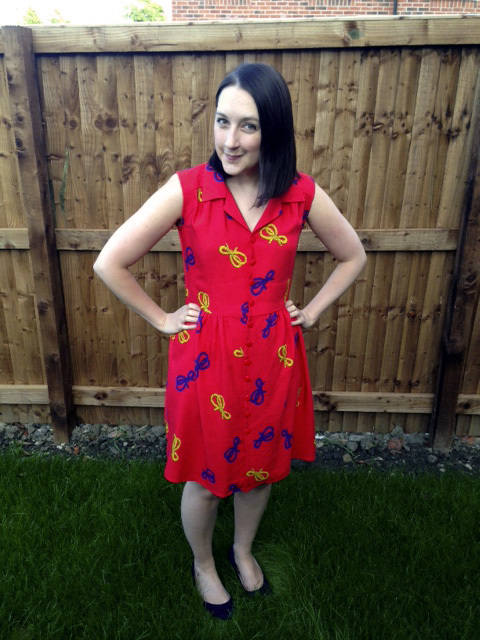 Love this frock and the fabric you chose, so darling! Gosh I know, sorry. All of the printed silks are bloody amazing!!! It’s like a torture seeing all that loveliness for sale. I wish I lived a silk kind of life heheh. With half a metre you could make some lush silk underwear though? I love this fabric, and it makes a great shirtdress! Joel & Son have so many lovely fabrics – it’s a very dangerous site to visit! Yes, found something I want! Sadly its silk twill at £74.90 a metre! I love J&S but sadly it is just window shopping. I love the sound of this fabric though – no ironing really is the best! Oh it’s jolly well fab! Great tip about lining in prep for the ~ahem~ upcoming weather! Great colour, it looks fab with your hair. Exciting you’re in the new house too! I love the print! You look absolutely gorgeous! And congrats on having moved houses now! What a sweet dress! I love the print! This looks great and so happy!!! A good dress for dreaded Mondays mornings?! I’m nt aware of the website, so will pop over and have a look. at those prices i’ll be avoiding that site! really cute dress tho – the colour suits you! Fleet week!! Such a cute dress, but not ‘cute’, you know what I mean? Looks great on you.